I am the owner of Coaching Canin. I always had the dream of understanding our canine friends and their incredible bond with us. To make this dream come true, I moved to America to study at one of the best trainers' facilities. K9sOnly is a state of the art facility for our canine friends, the most prestigious place for doggies on the west coast. I had the chance to learn dog training with Bobby Dorafshar, unanimously considered as a master in his field. I live all day around dogs, this a great experience for me: more than training methods, I learn how to read dogs in their casual life. 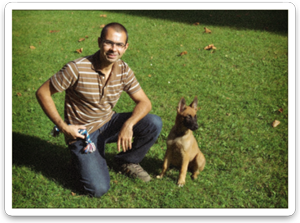 Back in France, I volunteer in a training centre, the ACDM (Amicale Cynophile de Marcoussis). This experience gave me the opportunity to understand french people's expectations. I confirm my skills by passing the CETAC (Certificat d'Etudes Techniques de l'Animal de Compagnie), a french certification that allows me to work legitimately as a dog trainer in Paris.